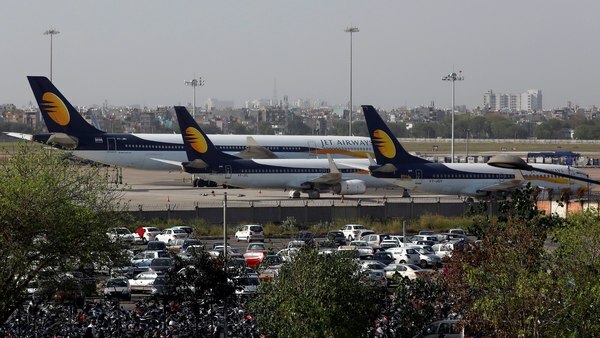 Reuters - Jet Airways plans to extend its suspension of international flights until Thursday having not received any interim funding from lenders, the company said in a letter to employees on Monday. On Friday, aviation secretary Pradeep Singh Kharola had said Jet had the money to operate only six or seven planes over the weekend and that lenders would have to decide how many planes it could fly through this week.. Jet now has about 44 flights, and only about seven operational aircraft, a senior pilot with the airline and a member of the pilots’ guild told Reuters on Monday. The airline had more than 120 aircraft operating a year ago, but competition from low-cost carriers such as IndiGo and SpiceJet Ltd, together with high oil prices, hefty fuel taxes and a weak rupee have lately piled on pressure. Jet’s employees marched last week to its headquarters in Mumbai to demand clarity on whether they would get paid soon and if their jobs will be secure over coming months. Earlier on Monday, Jet’s pilots and engineers also gathered at its office in Mumbai demanding answers.